Bob and I were at the King winery this past weekend. We had gone to watch a marathon and sample a flight or two of some highly recommended wines. We weren't the only visitors. Sheep, an uncommon occurrence on the estate, were grazing in the orchards and the vineyards. The flocks had been rented to assist in "vegetation control". Goats, as in herds for hire, are not uncommon here. The state uses them to clear vegetation on slopes that are too steep for highway crews to safely work on. This was, however, the first time I'd seen sheep used to clear the land of others. It seems they are more discriminating in what they eat than goats, and there is less chance they will eat vines or damage trees. While watching the race, I struck up a conversation with the man standing next to me. I asked him what he did. He said he was a shepherd. Choking back a laugh, I was about to introduce myself as Mother Goose, but my better angels and long dead mother stopped me. Turns out, he was one of three people responsible for the flocks. He was the "lead shepherd". His words, not mine. A lot of lamb is raised in the areas surrounding the estate, so the same farms that supplied sheep for vineyard maintenance also provided a fresh supply of lamb for my freezer. 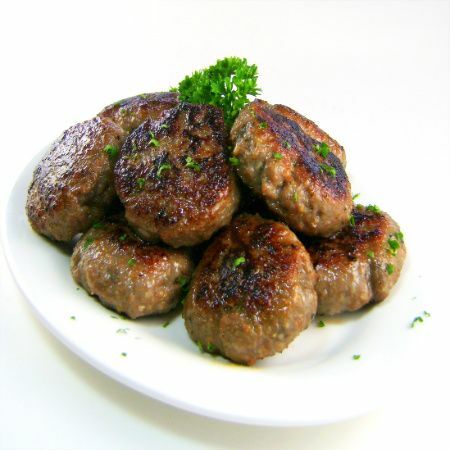 I have several recipes that I've wanted to try and I though this would be a great time to test those for lamb sausage. I'll be featuring them over the course of the next two weeks. This recipe is based on one developed by Michael Symon. His recipe makes a delicious Middle Eastern-style sausage but it is very spicy and I'm not sure it would appeal to all of you. So, I've cut way back on the amount and source of the chilies used to season the lamb. I've also taken a few shortcuts that make the sausage easier to prepare. I hope you'll give the recipe a try. If you like lamb, I know you'll like this sausage. Here's the recipe. 1) Warm oil in a medium frying pan. When oil shimmers, saute shallots over medium heat until translucent , about 4 minutes. Add garlic and saute until fragrant. Remove from heat. Cool completely. 2) Combine onions, garlic, lamb, paprika, pepper flakes, cumin, chili powder, salt and sugar in a large bowl. Cover and chill from 2 to 24 hours. Form into patties or logs. Sausage may be refrigerated for up to a week. It may also be frozen. Fry over medium heat until patties reach an internal temperature of 150 degrees F. Yield: 12 patties.